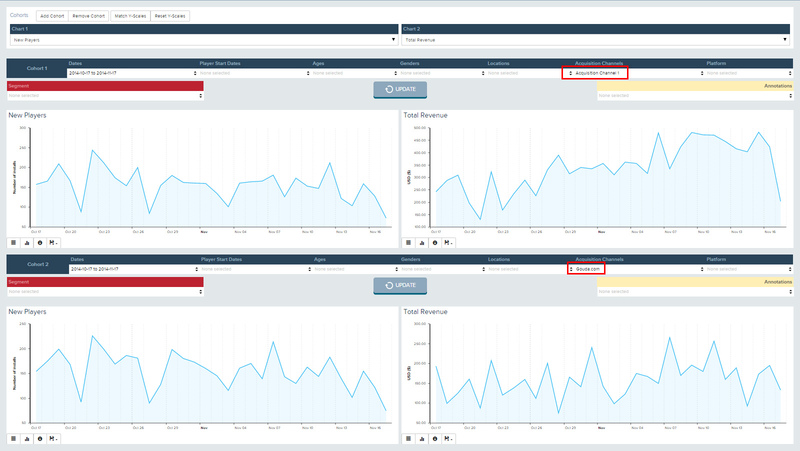 Marketing campaign data from attribution providers can be used to segment your charts, queries and campaigns. deltaDNA can accept attribution data from your game and provide the tools to analyse, understand and improve retention, monetisation and player behaviour across player demographics and acquisition campaigns. deltaDNA has direct integrations with some attribution providers but you can define custom attribution events and parameters to accept attribution data from any source. The following image shows the Acquisition Channel parameter being used to compare the number of new players and revenue from two different, fictitious, advertising networks. Whilst the number of new players is similar this comparison clearly shows that players from Acquisition Channel 1 monetise better over time than players acquired from Gouda.com. You can add additional filters to drill in to the behaviour in more detail and you can view any of the game analysis charts. You are not limited to using the Cohort Comparison tool, you can also use the LTV Predictor, Retention Predictor, Slice & Dice, Data Mining and Direct Access tools to analyse your attribution data and the Segmentation tool along with A/B Testing, Targeting and Push Notifications to target players from specific campaigns or demographics. You should send your attribution data to deltaDNA by passing any attribution parameters retrieved from your attribution partners SDK to the deltaDNA SDK. 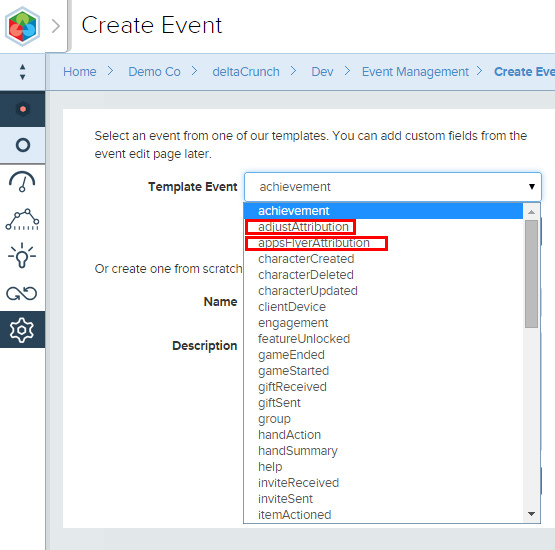 The Event Management tool gives you complete control over the events and parameters you send to deltaDNA and predefined event templates are provided if you are working with Adjust or AppsFlyer. The attribution parameters that you use to segment and target your players will largely depend on the attribution partner you choose. However the following guidance applies regardless of attribution partner. acquisitionChannel : It is up to you what you populate the acquisition channel parameter, there is no common definition of this parameter across attribution providers and games. This is your highest level attribution parameter. It is used as a Dimension in Slice & Dice and is available as a filter across all your Games Analysis charts. It is also visible on all events in Data Mining and Direct Access. It should therefore be populated with the most important, highest level, of attribution that you want to track (ask yourself, where do I spend my marketing bucks as this will generally be the level of granularity you want for the acquisition channel).Because the acquisition channel is defined as a dimension you shouldn’t populate it with too many distinct values. An acquisition channel list of 12 entries is great to work with but you’ll give yourself headaches if you try and define hundreds of different acquisition channels.Many games will concatenate a few attribution parameters together to form their acquisition channel. E.G :: might return TapJoy :: Halloween Campaign 2014 etc.. The acquisition channel parameter is limited to 72 characters long.